Winter is a busy time in Ottawa! There are so many fun winter activities that it almost makes me happy that sub zero temperatures linger here until April... almost. Visit the museums that are free on Thursday nights. Winter seems like the perfect time to do this, since it's dark by 4 anyways. Seems obtainable, right? Even taking into account the 10 days we'll be out in British Columbia? Like I said. Thank goodness you can count on an Ottawa winter to dump an April snow storm in your lap! 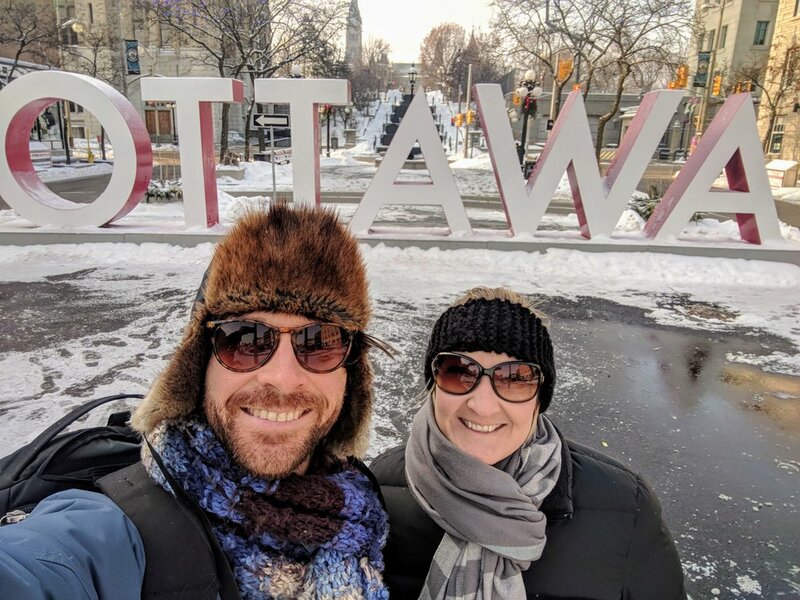 Wanting to get a jump on our list, I booked us 2 free tickets to skate on the Canada150 rink on Parliament Hill on the first day that wasn't -30 degrees Celsius. Getting the tickets was surprisingly easy and straightforward. They are sent to your email immediately to be scanned. There were lots of options, so we chose a Wednesday morning at 11am. You get a 40 minute time slot, which in my opinion is plenty of time for skating in circles. Being a weekday around 10:30 am we found parking in the Byward Market easily and used the parking app to pay- so convenient!! Its a quick walk to the Hill, especially in perfect winter weather! There was a security bag check, our tickets were scanned and there were plenty of picnic tables to change into skates. I really liked that you could leave your boots on the bench while you skated, as opposed to the canal where I feel like you have to carry them with you in a backpack. Side note: there are cubbies to leave your boots in in the canal change rooms as well. We have left our boots in them and they have been waiting for us after our skate every time. It still feels a bit weird though, because if you return and your boots have left without you, walking home will be very unpleasant. Skating on the Canada150 rink was awesome. Parliament Hill is one of my favourite places for a picnic; and, also, skating it turns out. The ice was in excellent condition, the view is great and there is upbeat music keeping the mood light. Twenty minutes into the skate everyone changes direction, which was an entertaining little detail. Everyone was in a good mood and all the staff were particularly friendly. If you live in or are visiting Ottawa, I would definitely recommend fitting a skate in on the rink before it closes at the end of February. Being a special event, who knows when we'll be able to skate on the Hill again?